TOUR GUIDE RESPONSE: Thanks for your good review!welcome back again. Stone provided a very good itinerary to enjoy the beauty Lijiang, Shaxi and Shangri la. Stone is very knowledgeable about local culture/religion/history that we chatted during the tour. He is a very friendly tour guide and flexible to fine-tune the itinerary base on our interest with great recommendation. We enjoyed this fabulous trip. TOUR GUIDE RESPONSE: thank you so much for your good review! welcome back again! TOUR GUIDE RESPONSE: thank you so much for the good review and suggestion! welcome back again! all the best! Stone was a wonderful guide for our group, a family of 6 adults. During the whole trip he offered a deep insight into many aspects of Chinese history, religion, culture and food. Stone is an informative guide sharing his extensive knowledge in a relaxed way, and a very pleasant, attentive, flexible, easy-going person. Thanks to him our trip to Yunnan became a fabulous and unforgettable adventure. Highly recommend both the tour & the guide: 5+ stars !! TOUR GUIDE RESPONSE: thank you so much for the good review. all the best to everyone! welcome to china again! I and my wife have very much enjoyed the tour to Dali and Lijiang guided by Stone. The guide - Stone - is a seasoned guide with a volume of knowledge on the histories and backgrounds of the places we visited. He is quick in understanding what we need and want and in coming up with best ideas/solutions to them. I and my wife are deeply impressed by his ability not only as an able guide but also as a very friendly and considerate person. We will most likely try to find him in our next visit to Winnan. TOUR GUIDE RESPONSE: Thank you so much for your good reviews. Welcome back again! Stone is an excellent tour guide and his English good! He helped customize an itinerary that worked well for us that was based on one of the his set tour packages, so we appreciated that. He had an answer for all of our many questions and brought us to many tasty places to eat, so his local and regional knowledge are excellent. We were very comfortable and happy with Stone and look forward to booking another tour with him in the future! TOUR GUIDE RESPONSE: thank you so much for your good review and welcome to come back again! also thanks for all your good suggestions. all the best! We had a most enjoyable tour of 5 days in Yunnan with Stone. He was always punctual, reliable, and very flexible in accommodating our desires and changes. Stone also introduced us to lovely local cuisines all over. I highly recommend Stone as a guide. TOUR GUIDE RESPONSE: you are welcome! hope to meet you at next trip to yunnan. all the best! Stone was an excellent tour guide. He was very knowledgeable about the places of interest and he went out of the way to make sure that our group really enjoyed the private tour. I would highly recommend Stone for anyone who wishes to see both Shangrila and Lijiang. TOUR GUIDE RESPONSE: thanks for your nice rivew. welcome to visit china again and hope everything is well for your family. Very good itinerary to enjoy the beauty of Shangri la. Stone is very knowledgeable and friendly tour guide with great recommendedation and patience. We enjoyed a lot during this trip. The last paradise on earth. TOUR GUIDE RESPONSE: thanks for your high rate review! welcome to shangrila again! TOUR GUIDE RESPONSE: thanks for your good review and high rate. welcome to trave with me again when you have time and need me. thanks again! Stone was incredible. He tailored the tour to our interests and kept going until we told him to stop. He was informative, polite and friendly. He put tremendous effort into the planning and execution of this tour. TOUR GUIDE RESPONSE: thank you so much for your great review and your trust. i will try my best to make all the guests feel good and enjoyed the tour with me. We have an enjoyable time on our tour which encompasses two provinces, Yunnan and Guizhou. Stone was both a driver and guide for us. He is trust worthy and was very attentive to details. His hotel and meal arrangements were excellent. Vehicle was safe, clean and well maintain. Given the breath of cultural diversity of the two provinces visited, his local knowledge was good. Excellent in some regions and satisfactory in others. Definitely will use again if we return to this part of the country. TOUR GUIDE RESPONSE: thank you so much for your good review. thanks for your trust! Stone was one of the best guides we've ever had. He knew our pace and was smart and flexible enough to change the plan when necessary. He knows all about the whole area and we had some great conversations with him as well. He was extremely accommodating and was able to find us halal (qing zhen) food everywhere we went even to small villages. We could not have had the great experience we did without him. TOUR GUIDE RESPONSE: thanks for your review! what i did just what i need to do as a local guide. hope everything goes well! Very pleasant guide. Helpful and knowledgable. Punctual. On a few occasions, he ordered too much food for us. Could have warned us that the drive from Kunming to Dali takes 4 to 5 hours and the drive around Erhai Lake takes 3 hours. We were exhausted by the time we reached the lovely hotel. TOUR GUIDE RESPONSE: thank you for the review! sorry for did not warn you the long day from kunming to dali. hope the whole family are well! TOUR GUIDE RESPONSE: thank you so much for taking your time to write a review for the tour! you are welcome to come back again! all the best! Stone was extremely easy-going and knowledgable about Yunnan culture and history. He made us feel at ease and if ever we wanted to make a detour and check something out, he made it possible. 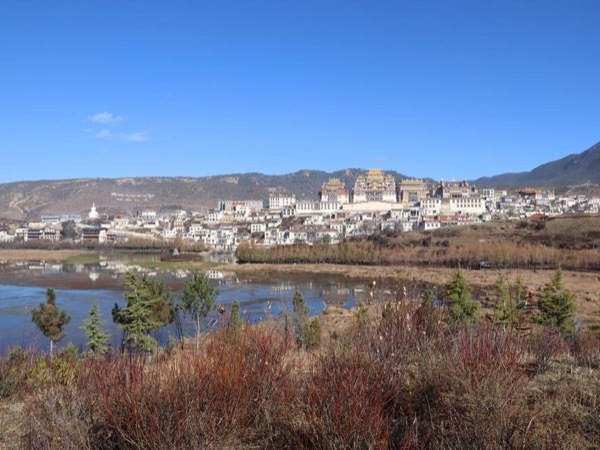 We also got to visit parts of Yunnan we had never heard of! Lovely, excellent tour guide - we had an unforgetable trip and would recommend Stone to anybody! TOUR GUIDE RESPONSE: thank you so much and welcome back to china again! Stone was one of the best guides we had on our 3 week tour of China. Companionable, educated, knowledgeable and interesting, he was happy to answer all our questions - history, religion, current China, the Communist Years, all in excellent English. He was also great with our 2 girls, age 6 and 4. We had a fantastic day - tea and cheese in a farmers hut; miles of sun sparkling snow mountains at 4500m, stunning monastery - and I would recommend him without hesitation. Many Thanks from the Thaker family, UK. TOUR GUIDE RESPONSE: Dear Natasha and your whole family: thank you so much for your nice comment on my job. all the best!